In Part I, we discussed how a true relationship with Mary requires takes a decision of both the head and the heart. In this second installment, I would like to show how my personal relationship with the Queen Mother was no different. 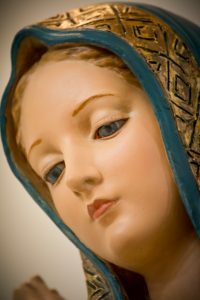 For much of my adult Christian life I was more interested in knowing about Mary than getting to know her. Then upon visiting the Vatican in 2004 I received some rosary beads blessed by Pope John Paul II. I began praying the Rosary on a regular basis and with this came a steady growth in my love for Our Lady. In 2008, I was in Biloxi, Mississippi working to rebuild after Hurricane Katrina. We were staying in a recently rebuilt parish and there was a small chapel with the Blessed Sacrament within our quarters. On a Friday afternoon, my wife who was 25 weeks pregnant at the time, called me in a panic. She was bleeding rather heavily and was headed to the Emergency Room. In a panic, I started checking flights back to Raleigh. The last flight of the day was leaving in 90 minutes from New Orleans, an hour away with no traffic—unlikely given it was rush hour. As I debated whether to try to get to New Orleans or simply rent a car and drive the 13 hours, I was paralyzed. Almost instinctually I grabbed my rosary beads and headed to the chapel. I knelt down and immediately the chapel filled with the most beautiful light. It was so beautiful that it began pushing me closer and closer to the Tabernacle. The source of that beauty could only be one person because she always pushes us closer to Jesus. 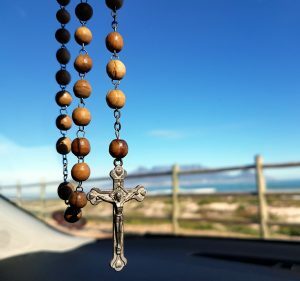 At that point, a gentle voice spoke to me saying “They are under my protection.” My eyes filled with tears and my fingers rolled over the beads, knowing I was not praying alone. I was filled with absolute certitude that both my wife and my son were under Mary’s protection. Gone were my anxiety and worry and they were replaced with peace. To this day, I do not know how long I prayed there, but I do know that as I made the sign of the Cross and the word Amen crossed my lips, my phone rang. On the other end of the line was my wife telling me that all was fine. They found a significant amount of blood, but could never find the source. Our Lady had delivered! But that was not the end of the story. That same son was born 14 weeks later. He had the umbilical cord wrapped around his neck twice and was tiny. He was transferred to the NICU and the doctors struggled to help him. 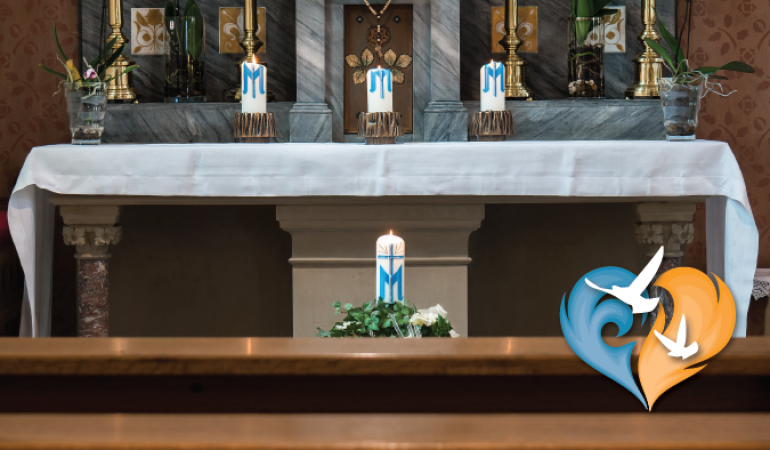 Throughout those two weeks, I was completely at peace, remembering Our Lady’s promise. Not because I was sure he would live, but I was sure that both in life and in death he would belong to her in a special way. Three years later he was diagnosed with Autism. One of the greatest challenges parents face is not knowing how deeply Autism will affect their child. Will he live with us for his whole adult life or will he merely be a little quirky (or anywhere in between)? While this worry infects nearly all special needs parents, Mary’s five little words to me keep me anxiety-free. I am not indifferent, just fully aware that regardless of how it turns out, she will be with us. It doesn’t take much connecting of the dots for me to realize that if she is powerful enough to help in what seems to be the most desperate of situations that she can help in all the others as well. By going to her when I was desperate she has shown herself a Mother in all things. If God is so good and so powerful that He empowers a mere creature to do what she can, then He too is worthy of my radical trust. Do you not know that I am your Mother too? My experience may have been extraordinary, but I am under no delusions that it is something wholly unique. She does this for everyone who calls upon her. “Of the essence of motherhood is the fact that it concerns the person. Motherhood always establishes a unique and unrepeatable relationship between two people: between mother and child and between child and mother. Even when the same woman is the mother of many children, her personal relationship with each one of them is of the very essence of motherhood” (RVM, 45). An awesome reminder of the very personal relationship the Blessed Mother desires to have with each of us so she can lead us to her Son. Thanks for sharing Rob….